Jay R. Reynolds, Inc. has completed over 300 construction contracts. Jay R. Reynolds, Inc. was awarded the plumbing construction contract for the 72 million dollar Additions and Alterations to Quakertown Community High School. The value of the plumbing construction work we performed was over 4.4 million dollars. 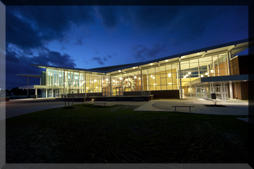 This LEED Silver project was phased over 4 years in order to maintain educational normalcy for the students. 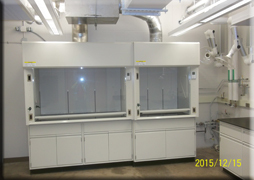 Jay R. Reynolds, Inc. performed the phased plumbing renovations at The Penn State University Material Research Lab. The work included plumbing fixtures, lab connections, plumbing equipment, and plumbing specialties. The following piping systems were installed for the project: sanitary drainage, DWV, storm drainage, site water, domestic water, acid waste, gas, air and nitrogen. Jay R. Reynolds, Inc. performed the plumbing restroom renovations and ADA code upgrades in the historic Forum and Finance Buildings located in the Capitol Complex. The multi-story buildings remained occupied during the tightly scheduled and coordinated multiple prime project. Jay R. Reynolds, Inc. performed the 5.4 million dollar Main Steam Tunnel Renovations at the State Correctional Institution - Camp Hill. The project involved construction and repair of concrete steam tunnels inside of the operating facility and the installation of new brackets, steam piping, PRV stations, condensate piping, and demolition of existing systems. Jay R. Reynolds, Inc. was awarded the plumbing contract for a new dormitory in the center of the Kutztown University campus. The value of the work performed was over 7.2 million dollars. Dixon Hall is one of the largest dormitories in Pennsylvania, accommodating 865 students. The seven story 256,000 square foot residence hall contains over 1,200 plumbing fixtures and more than 20 miles of plumbing piping. The Bryce Jordan Center is a 375,000 square foot multi-story complex that hosts academic assemblies, cultural events, Big Ten basketball, conventions, circuses, concerts, and THON, the largest student run philanthropy in the world. 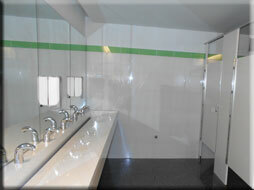 Jay R. Reynolds, Inc. performed both the plumbing and fire protection contracts for the 16,000 seat arena. Jay R. Reynolds, Inc. was awarded both the plumbing and heating contracts for a cell block renovation in an occupied maximum security prison. The value of the work performed on the two contracts was over 6.3 million dollars. The entire project from demolition and rough-ins to finishes was completed in a nine week timeframe under a tight schedule and difficult jobsite logistics. Pennsylvania’s Capitol Building is a national historic landmark that displays outstanding architectural and artistic features. Jay R. Reynolds, Inc. was qualified as a historical contractor and awarded three separate renovation contracts. The value of the work performed on the three contracts was over 2.2 million dollars. In addition to plumbing and heating work, our contract scope included carpentry, electrical work, architectural finishes and casework. Jay R. Reynolds, Inc. was awarded the plumbing contract for the renovations and major expansion of the Harrisburg Senators baseball stadium located on City Island. The project started after the last home game of 2009 and was ready for opening day in 2010. The project has been widely praised in the media and was recognized as the “Renovation of the Year” by Ballpark Digest. 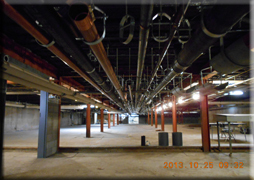 Jay R. Reynolds, Inc was awarded the Plumbing - Roof drain Contract for the Keystone building located in Harrisburg, PA. The 11 story 845,000 square foot building has over two hundred roof drains, scupper drains, Plaza drains, Planter drains, etc. The contract also included the majority of the site utilities for the building which are primarily installed under Commonwealth Avenue and North Street. Jay R. Reynolds, Inc. was awarded the plumbing construction contract for the New Materials Testing Lab. The value of the work we performed at this 107,500 square foot state of the art laboratory facility was over 2.8 million dollars. 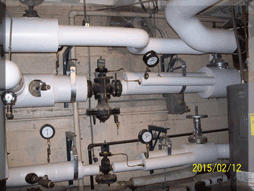 In addition to the typical plumbing systems the project included the installation of over a dozen different specialized gas and air systems and associated equipment utilized in the material testing operations of the Pennsylvania Department of Transportation. Jay R. Reynolds, Inc. was awarded the plumbing contract for 2.7 million dollars. The new 478,000 square foot High School included a swimming pool, two gyms, auditorium, kitchen, mechanical rooms, toilet facilities throughout, locker rooms and science classrooms. Jay R. Reynolds, Inc. was awarded the plumbing construction contract for a new prison for drug offenders. The 640 cell, high-rise structure includes kitchen, education, recreation, office, laundry and maintenance shop facilities to support the prison. Jay R. Reynolds, Inc. was awarded the plumbing construction contract for the Additions and Alterations to the Chambersburg Area Senior High School. The value of the plumbing work we performed was over 3 million dollars. This 73 million dollar, 509,000 square foot complex was the largest construction project the community had seen in decades according to the School District’s website. The phased construction to the occupied school was completed while maintaining educational normalcy for the students over the scheduled 3 year period. Jay R. Reynolds, Inc. was awarded the plumbing contract for the two story science laboratory renovation. The work included the standard plumbing systems along with lab equipment connections and the following specialty systems: deionized water, protected water, acid waste, air, vacuum and various gas systems. Jay R. Reynolds, Inc. was awarded the 1.9 million dollar plumbing construction contract for the Midd West High School. The 193,000 square foot building was designed to accommodate 800 students. The project is LEED Gold Certified and a 2012 AIA Design award winner.